A research team from the University of Houston and Boston Children's Hospital debuted a novel new approach to internal medicine: using a swarm of tiny, noninvasive robots as a gauss gun to shoot medicine or clot-busting needles directly at the afflicted tissue. 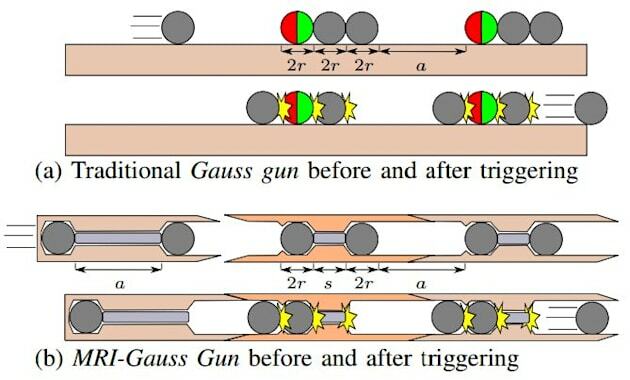 Much like rail guns, gauss guns rely on a series of magnets to accelerate objects -- the difference being that these guns transfer force through the magnets themselves, converting the stored magnetic energy into kinetic. In this application, the swarm of tiny steel "millibots" act as the gun. They would be injected into the patient and individually "steered" into position using an MRI machine whose powerful magnetic field also magnetizes each one. An activator millibot is sent in last and, when it hits the next robot in line, the gun "fires." Each subsequent robot imparts a small amount of additional energy to the cascade effect. When all this energy reaches the front of the line, it can be used to do a variety of tasks like "puncturing a membrane to release trapped fluid, opening a blocked passageway or delivering a drug to a tissue location several centimeters from a fluid-filled space," according to the researchers. The team's initial proof-of-concept test has shown that the technique does work, as you can see in the video below. Up next, the team will work to miniaturize the robots, getting them small enough to actually fit in your bloodstream, before beginning clinical trials. "Future work," the authors wrote, "should investigate how the design can be optimized for clinical use cases and implement closed-loop control of the components." Unfortunately, there's no word on how much time that's going to take.